Shivakumar or ‘Shiv’ as he is popularly was President - AIMA (2012-2013) . Shiv is an Engineer and an MBA. Shiv is essentially a Marketer and a General Manager. Shiv has run more than 34 brands in his career over two decades. Shiv is a ‘growth’ manager, having grown every brand and business he has been associated with. He has a track record of building brands, developing people and bringing creative and innovative business model solutions in the categories and industries he has worked in. Shiv is an avid reader, he writes regularly for business magazines and teaches regularly at all the top business schools across the world. The achievements of the Nokia India team under Shiv have been case studies at Harvard, ISB and the Ivey School of Business. In the last six years, Nokia has become India’s largest multinational and also was the most trusted brand between 2007 and 2010, surpassing many hundred and fifty year old household brands in India. 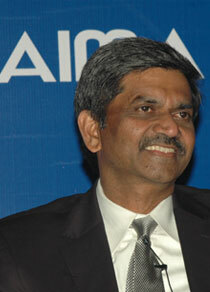 Shiv is on the board of Godrej Consumer Products and is also the President of the All India Management Association. Shiv has received many awards, One of top five Marketers in India 2003, Brand Builder of the year in 2008, Best CEO in 2009 and recently his alma mater IIM Calcutta awarded him the most distinguished alumnus award in November 2011 during their golden jubilee celebrations, one of nine alumni to get this in the history of IIM Calcutta. Shiv follows sport and is a keen sportsman himself. Shiv is married to Hamsini, who runs her own Brand and Innovation consulting firm.